After a brief hiatus the previous week, speculators have piled back into the most-over-crowded trade in the world - Long The US Dollar. As Goldman Sachs notes, overall USD speculative net long positioning increased $2.0bn to $45.7bn - a new record high. We have used two indicators in the past to gauge investor positioning in currencies: 1) spec positions based on CFTC/IMM data as shown above1 and 2) the beta of currency hedge fund returns to daily currency changes as shown in Chart A18 in the Appendix in the case of the US dollar. The latter is calculated as the rolling 21-day beta of currency hedge fund daily returns to daily changes of the JPM Dollar tradable index. We use the Barclay index to proxy currency hedge fund returns. Chart A18 shows some recent divergence between the two suggesting that currency hedge fund USD longs are not as extreme as those of CFTC reporting spec investors. This broader universe of spec investors reported by the CFTC includes, beyond currency hedge funds, macro hedge funds and asset managers. In other words, macro hedge funds and asset managers appear to be more overweight the USD than currency hedge funds. 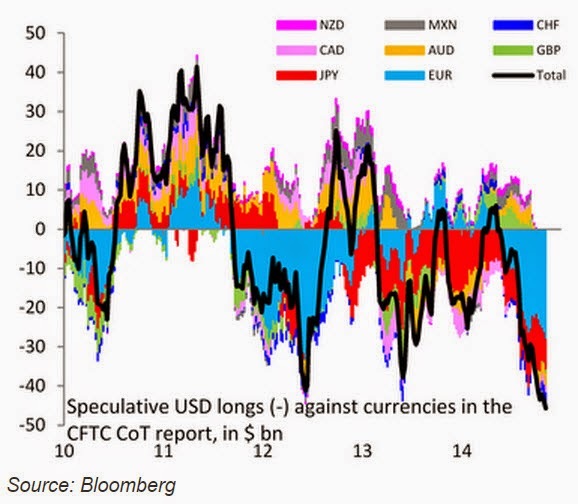 With the caveat that the currency hedge fund betas are volatile and are based on a small sample of currency hedge funds, Chart A18 suggests that the message we get from CFTC positions that USD longs are very extreme should be somewhat diluted. If you are a trend follower, the trend is your friend.